The actor Nakamura Tomosa II held the name of Nakamura Momosa I from 1812 to the 12th lunar month of 1830. 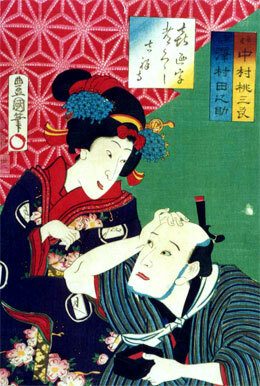 A minor jitsuaku actor held the name of Nakamura Momosa in Nagoya at the Tachibana no Shibai around 1837 and 1838. Unknown dates of birth (in Kamigata) and death. His first stage names were Ichikawa Tomonosuke and Ichikawa Enshô I. He became a disciple of Nakamura Tomosa II in 1854 and received the name of Nakamura Momosa II. He left Ôsaka for Edo at the end of the 1850s or the very beginning of the 1860s (after the death of his master the 16th day of the 3rd lunar month of 1861 ?). He took the name of Nakamura Tôzô in the 8th lunar month of 1864 in Edo at the Ichimuraza and his name disappeared afterwards from theater playbills. He was, just like his master, a dôkegata and handôgataki but never really achieved any fame for himself.